I'm on the cooking contest bandwagon, this time with a savory recipe. 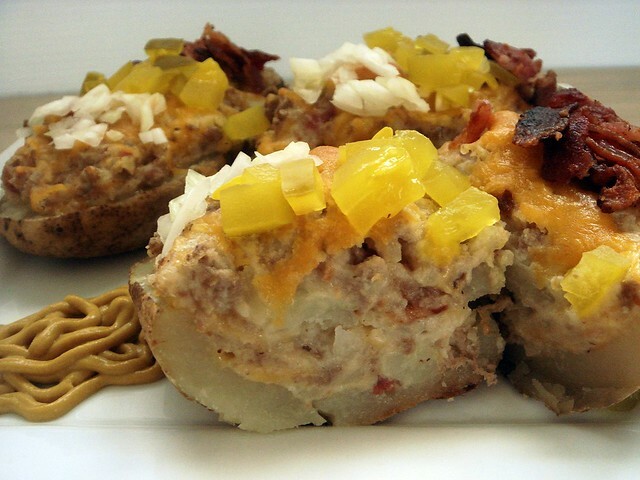 Potatoes, Taters and Spuds is hosting a Twice Baked, Twice as Smart Recipe Photo Contest. 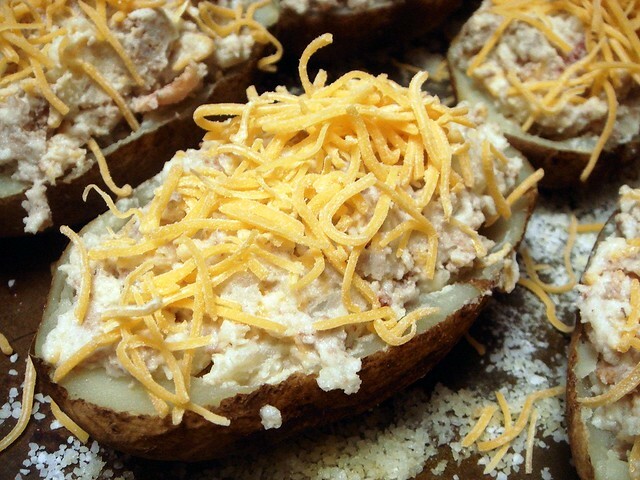 The objective is to create an original twice baked potato and upload the picture. I chose to create a bacon cheeseburger stuffed potato with bacon, of course, and ground turkey. You start off by roasting potatoes. 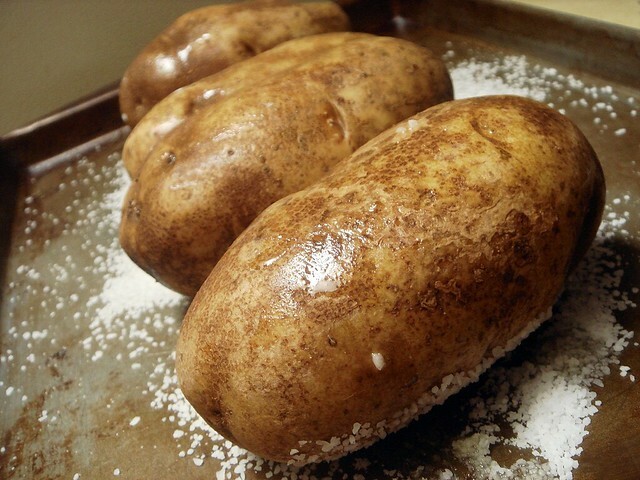 I washed, scrubbed, and dried 4 potatoes, placed on a bed of salt and lightly drizzled with olive oil. These baked for around an hour and a half, until easily poked with a fork. 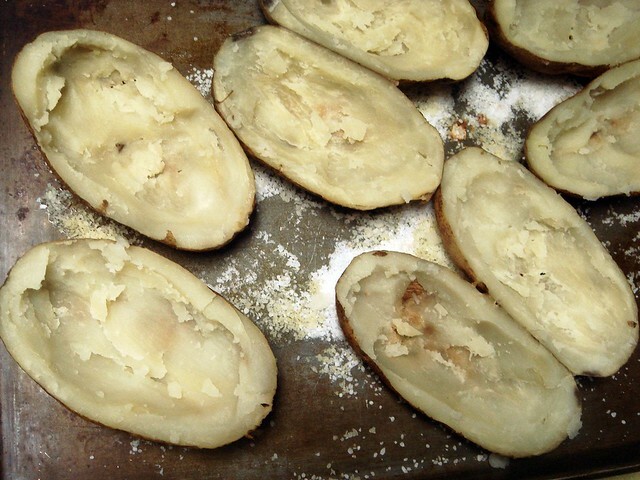 Once the potatoes are cool enough to handle, each potato is sliced in half and scooped out. Added to the potato pulp is sour cream, bacon pieces, cheddar cheese, dill pickle juice and onion powder. Folks, onion powder is the reason these potatoes taste exactly like a McDonald's cheeseburger. It's freaky how close the filling tastes to one, so although this version is a bit healthier thanks to the ground turkey, you really don't miss the beef. Or at least I don't think you do. 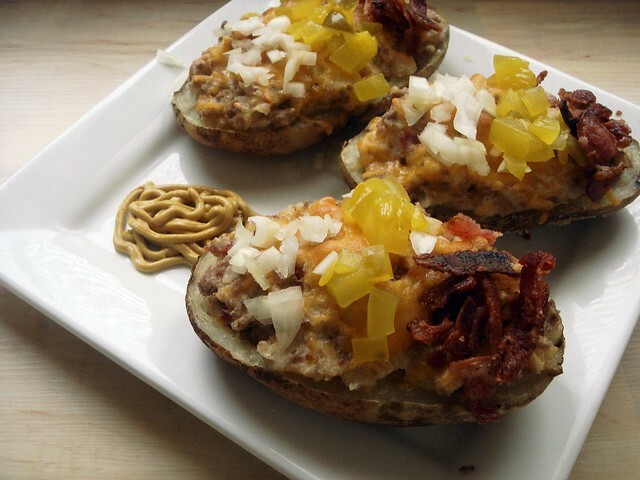 Each potato skin gets stuffed and topped with cheddar cheese, then baked for another half hour to heat thoroughly. 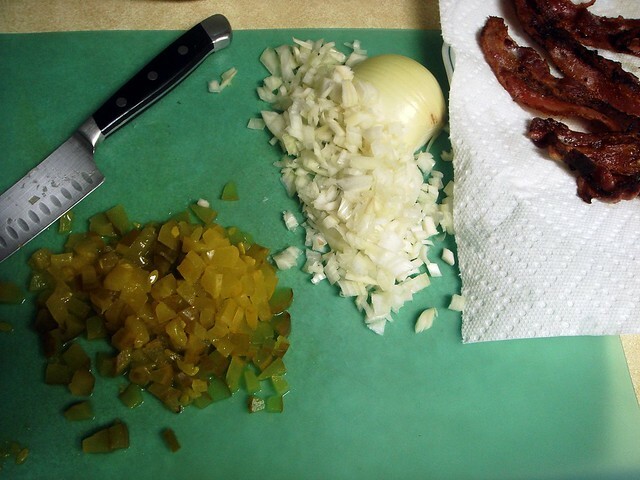 For the garnishes, you have finely chopped onions, dill pickles, and more bacon! Are you hungry yet? And that's how you make a bacon cheeseburger twice baked potato, answering the question, "Do you want fries with that?" Preheat oven to 350°. Sprinkle rimmed baking sheet with 3 tablespoons salt. Wash and scrub potatos, patting dry. Poke each potato 5 times with a fork, then place on baking sheet. Drizzle the tops of each potato with 1/4 teaspoon olive oil. Bake until tender when poked with the tines of a fork, 1 hour to 1 hour and 30 minutes. Remove sheet from oven and let cool. When cool enough to handle, slice each potato lengthwise and scoop potato flesh out into a large bowl, leaving a shell. Meanwhile, in a large skillet cook bacon strips in two batches, until crispy. Transfer to paper towel-lined plate. Crumble bacon when cool. Remove all but one tablespoon bacon grease from skillet; add ground turkey and cook until no longer pink, about 5-7 minutes. Let cool. 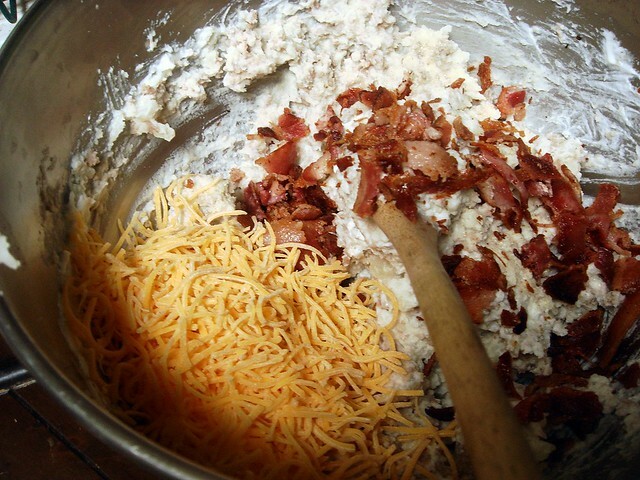 Add turkey, half of the crumbled bacon, 3/4 cup cheddar cheese, sour cream, salt, onion powder, and pickle juice to potato flesh; stir to combine. Divide between skins and place back on baking sheet. Sprinkle tops with remaining 1/2 cup cheddar cheese. Bake for 30 minutes. Remove from oven and serve with remaining bacon crumbles, dill pickles, onions, and mustard. What a great recipe idea! Love it! that looks fabulous. you're so creative! Those look amazing! I'm going to try them this week. Looks like a great lunch idea to reheat at work! I haven't made twice-baked potatoes in years, and this looks outrageously good. I am saving this recipe. What a great idea with the bacon-cheeseburger theme. Thanks for sharing! PajamaChef - Thank you! They were delicious. Anonymous - Hope you like them! I have two in the fridge on hold for later, and the flavors will probably be even better. I'll follow your recipe to the last detail and hopefully i can have it done perfectly. 'll try it and share with my family. I just made this tonight and it was so so so good! !